For more than 40 years, The Paper Bag Players, a troupe of four talented adults, have created and performed high-quality programs for children. Their shows, based on a child's everyday experiences, combine short plays, catchy songs, free-spirited dances, audience participation, mime, and plenty of fun and surprises—and their latest original, contemporary, musical theater show will continue to amuse and delight kids ages four through nine (as well as their parents!). In Whoop-Dee-Doo!, the talented Paper Bag Players—named as such because they make their costumes and props mostly out of cardboard, brown paper, and paper bags—perform on stage for an hour—and kept my daughter and her four-year-old friend thoroughly entertained and giggling with delight for the entire show. 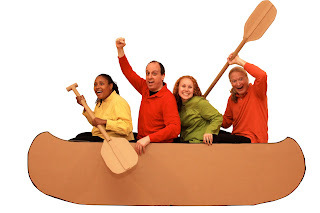 The troupe—Ted, Laura, Amy, and Kevin—all donning brightly-colored sneakers and exuding enthusiasm and energy immediately engaged the audience with their opening number, Get to the Show, where they soared in a hot air balloon, paddled a canoe, and caught a train—with each mode of transportation created completely out of paper and cardboard. Various vignettes featured throughout the show include stories about friends competing for customers at their cookie stands, pals spending the day on a lake fishing—and catching lots of adventure, a classroom disturbed by a little troublemaker, a little girl convincing her parents to let her keep her paper bag puppy, and more. Best of all, a short skit called Paper Bag Boogie encourages everyone to dance, including the audience—shaking, sliding, and boogieing along with the beat. As one of The Paper Bag Players, Ted Brackett (who also directs), has articulated, “The founders of The Paper Bag Players—52 years ago—were friends. Friends with funny ideas, funny stories, and lots of energy—things are pretty much the same today.” He continued, “We’re great friends, we have lots of fun creating the show, and at every performance, we work at making the audience feel like friends too!” He and his troupe have succeeded in attaining that goal. They need discount most of providers?? products and services to sit and learn fake louis vuitton sale even more don't forget to visitors some of our LV webpage. Any designer purses happen to be likely some the majority desired items of leatherwear related to. They're just fake prada sale fantastic details, showing wonderful skillfullness and then the perfect for substances. It can be outlined that they can be basically indestructible, earning him or her whatever container which are often surpassed regarding with woman that will boy as a treasure. Those fake rolex uk luggages happen to be moved by just numerous the sexes, during amongst the most common, the majority cool models for example Victoria Beckham to normal consumers fake gucci sale for example an individual's next-door neighboring. Frankly, they’re which means that well-liked that you will find quite a few louis vuitton replica handbags knockoffs together with knockoffs for these types of suitcase included in bazaars together with sells around the world. In reality, they’re at the same time rather highly-priced, running a simple container priced at the maximum amount as a terrific second-hand automotive.